The mere mention of Christmas likely conjures up images of fresh cut flowers of red and white nestled among deep green evergreens. They are, after all, the colors of Christmas. What you may not know is that Christmas colors and Christmas flowers are rooted in symbolism and supported by legend. Traditional Christmas colors are often seen in holiday bouquets and floral arrangements. Although they are bright and cheery that is not the reason they were chosen. The traditional red, white, green and gold originated in Christian religious symbolism relating to the birth of Christ. While you can transform nearly any flower into a Christmas flower by pairing it with Christmas colors, some flowers and plants have a reputation as a Christmas flower on their own. The delightful poinsettia has become a symbol of the Christmas holidays with its green foliage topped with bright flowers. Although the bloom isn’t a true flower and is really made up of special colored leaves, called bracts, these cheery flowers add a splash of color during the holidays. Bloom color ranges from pure white to shades of pink and red with many variegated varieties. Native to the mountains of Mexico, this Christmas flower has a colorful history. 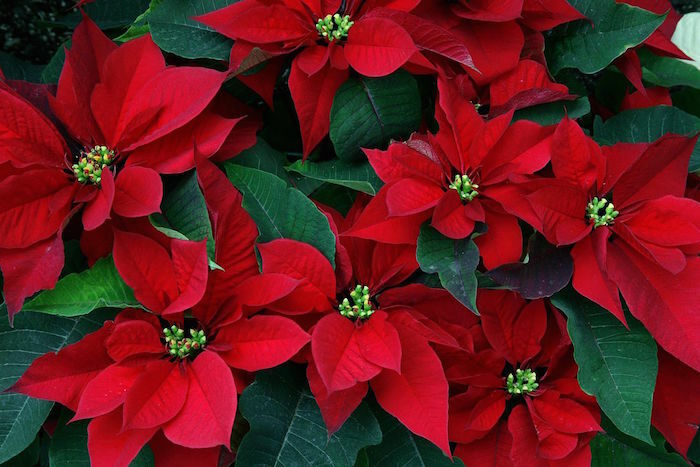 According to Mexican legend, a young girl named Maria and her brother Pablo were the first to discover the poinsettia. The two children were very poor and could not afford a gift to bring to the Christmas Eve festival. Not wanting to arrive empty handed, the two children stopped beside the road and gathered a bouquet of weeds. When they arrived at the festival, they were chided by other children for their meager gift. But, when they placed the weeds beside the Christ Child in the manger, the poinsettia plants burst into brilliant red blooms. The Christmas rose is a popular holiday plant in Europe because it blooms in the middle of the winter in the mountains across Europe. This plant isn’t really a rose at all and belongs to the buttercup family, but the flower looks like a wild rose with its white petals edged in pink. According to European legend, the Christmas rose was discovered by a shepherdess named Madelon. On a cold and icy night, Madelon watched as the Wise Men and shepherds marched past her carrying gifts for the Christ Child. Having no gift for the baby, she began to cry. Suddenly, an angel appeared and brushed away the snow, revealing the dainty Christmas rose beneath the snow. Madelon gathered the Christmas roses to present as her gift to the Christ Child. This popular holiday plant isn’t really a cactus at all, but it is a succulent that belongs in the same family as cactuses. It is native to tropical locations and thrives as a household plant. It produces showy arches of flowers in shades of pink and red during the dark days of winter giving it the name of Christmas cactus. According to legend, when Father Jose, a Jesuit missionary, tried to teach the jungle natives of Bolivia about the Bible and the life of Christ, be struggled to gain their trust and faith. He feared the natives did not comprehend the concepts he worked so hard to teach them. On one lonely Christmas Eve, Jose was overcome with the enormity of his task. He knelt before the altar seeking God’s guidance for leading the natives to the Lord. The joyful sound of voices singing a hymn he had taught them could be heard in the distance. As the sound grew louder, Jose turned to see the village children marching into the church with armfuls of bright flowers they had gathered in the jungle for the Christ Child. These flowers became known as the Christmas cactus. Holly is an evergreen shrub that produces glossy green leaves with sharp pointed edges, small white flowers and red berries. While American holly (Ilex opaca) differs from English holly (Ilex aquifolium), this prickly bush reminded the first European settlers of their native holly and they soon began using it in their Christmas celebrations. In Christian symbolism, the evergreen leaves represent eternal life, while the red berries represent the blood shed by Christ. According to Christian legend, a young shepherd boy brought a wreath of holly to the Christ Child as a crown. Upon placing the crown on the head of Baby Jesus, the young shepherd was overcome by the plainness of his gift and began to cry. Seeing the young boy’s tears, the Christ Child touched the crown. Immediately the holly leaves began to sparkle and the white berries transformed to brilliant red. Evergreen wreaths have a long tradition as a symbol of ever-lasting life. They also symbolize eternity or the eternal nature of God with no beginning and no end. The evergreen wreath hung over a window or on the door serves as a symbol that the spirit of Christmas dwells within the home. Some believe the evergreen wreath is an invitation to the spirit of Christmas. Evergreen trees like pine, cedar and spruce, have long been considered magical trees with healing powers. Both the ancient Druids and Ancient Romans used the evergreen boughs in festivals and rituals to celebrate the return of the sun and the renewal of life. Many were reluctant to part with the custom of bringing evergreen wreaths inside during the cold winter months after converting to Christianity. This gave rise to the new symbolism connected to evergreen wreaths. The evergreen wreath now symbolized finding a new life in Christ and/or eternal life. Don’t be afraid to experiment with evergreens and flowers when creating Christmas flower arrangements. Choose white or red Christmas flowers such as carnations, or try red roses and delicate white baby’s breath to tuck into evergreens. Add red or white tapered candles, red apples or a sparkly bauble or two to create a sensation of color and fragrance. Thank you for sharing the history behind these plants. I will use your link in Photography Contest I will now create. Blessings and Merry Christmas!